Seen one, seen ’em all. Whether you’re stitching the French knot or the colonial knot, in the final result, there’s no great difference between the two. Since there is no great difference in the end results between the French knot and the colonial knot, you can use them interchangeably. Even though on the outside, the two knots pretty much look the same, the French knot and the colonial knot are created differently. 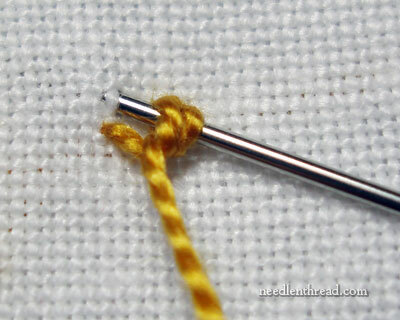 Here, you can see the twist of the thread on the needle as a French knot enters the fabric. You can see that the thread is simply twisted twice around the needle. Here, you can see the twist of the thread on the needle as a colonial knot enters the fabric. The “figure 8” twist used to create the colonial knot cause the thread to form more of a “hitch” than a “twist” on the needle. Since you can use the knots interchangeably, you may find that one is easier for you to make than the other. Many stitchers who have difficulty with the French knot, for example, have no problem constructing the colonial knot, so they opt for it whenever a French knot is called for. And the opposite is true: if a colonial knot is called for in a design and you aren’t familiar with the colonial knot, you can opt for the French knot. In the end, no one will take you to task for substituting one for the other. And few people can see the difference. But maybe you can! Which is which? So which do you prefer, the French knot or the colonial knot? Do you use them interchangeably? Have you ever noticed a difference between them? Do you find one easier to make than the other? What’s your take on these knotty things? I’d love to hear your views – have your say below! I love French knots but can’t execute a Colonia knot at all. Something about the twist never works and I end up with French knots anyway. My hands can’t seem to get the Colonial motion down. The trick is to wrap the thread in a figure 8 around the needle. I love French Knots and have never stitched a Colonial Knot! It looks like fun. 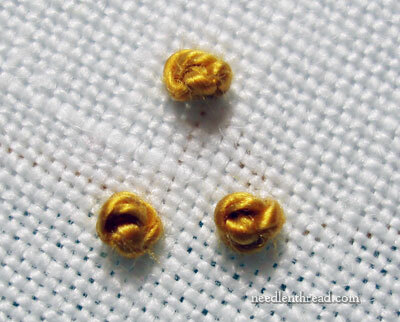 One question about French Knots – I wrap my needle three times instead of twice. Is this wrong? I guess this makes for a slightly larger French Knot. I actually think that colonial knots are slightly larger (and maybe “rounder”??) than French knots. I have done some projects from Teresa Layman (check out her website). She is a miniature artist and designs “doll house rugs” that are executed w/ knots — both French and colonial. She uses the French knots for the fine detail and the colonial knots for more of the fill-in background. Both are necessary and useful!!! It’s true – the colonial knot usually ends up a little larger than the French knot, because you can really tighten up the French knot more than the colonial knot, to make a smaller knot. But if you leave the tension a little looser on the French knot, it can come out larger, too, so the key is the difference in tension on the French knot, but in either case, using the same thread, you can pretty much create the same size knot with both the colonial and the French knot. I think you have more control over the size of the French knot than you do with the size of the colonial knot. In the photo above, to illustrate the fact that they can come out pretty much the same size and look pretty much the same, using the same thread, the two lower knots are one of each – the left knot is the French knot, and the right knot is the colonial knot. I am working on Wild Salmon from Teresa Layman. I found the colonial knot a nuisance. I decided where the pattern called for colonial knots, I used french knots and wrapped twice, and wrapped once for the french knots. I can’t really see the difference between the colonial knots and the double wrapped french knots. I like both but use French Knot most; if I need a bigger knot, then I use Colonial. When I was in college, I visited my grandma for spring break, and we quilted together. I expressed my frustration over French knots, and she showed me how to make a colonial knot, which I always use, to this day. When she passed away, I received a cigar box filled with all her crochet and tatting samples/patterns, and tucked in that box was the little scrap of material she used to teach me the colonial knot. It is one of my treasures! This is such a precious story. How wonderful it must have felt to see that in there. Must have felt like a hug from your Grandma. What a precious memory you have, Jane! My grandmother also taught me the art of knots…we spent an entire season adorning linens & pillow tops with French knots. Although she has been gone since 2006, I remember with great love our “knotty” times together. I started doing silk embroidery first and learned to make a colonial knot rose before other stitches. Now the closest I can get to a french knot is the way I knot my needle. Needless to say, whenever something calls for a french knot I do a colonial knot. I am glad to know others interchange them too. Colonial knots definitely! The french knot is basically held down on one side and sometimes those loops want to stand up annoyingly, the colonial knot is looped so that it always lays smooth for me. Maybe my french knots are just not right, but colonial works every time. I’ve always had trouble with French knots… perhaps I am not consistent in doing them, whereas I’ve never had a problem with a colonial knot. Then again, I haven’t done very many of either. I’m looking forward to method number two of making isolated knots without ugly thread trails (as if colourful slugs have visited the back of the work). I much prefer French knots, mostly because I cannot figure out how to make a colonial knot. I understand the concept of how it is made, but my brain can’t figure out how to make my fingers and needle do it. As a result, I am a whiz at French knots. Here’s something interesting I’ve heard about them. Apparently French knots are always supposed to be made with only one wrap of thread. If you want a bigger knot, you’re supposed to use additional strands of thread rather than more wraps (because of the “sticking up” issue that someone else mentioned). Anybody know anything about this? I will admit that sometimes I cheat and wrap mine twice. I use both knots and I notice a difference…is it perhaps because I made them, and no one else looking at my work notices the detail that I see with my much more critical eye on my own work?! Recently I taught our SAGA chapter a class on cast-on flowers. The cast-on flowers were made with #5 perle cotton. Part of the design was a forget-me-not which needed a larger “hole-filling” knot in the center, so the Colonial knot was my choice. The other part of the design was baby’s breath made with a single strand of floche. In order to achieve the more realistic looking blossoms, I used one-, two-, and three-wrap French knots. Maybe I’m just picky, but I think the choice of knot for each application was important. I feel like I can manipulate the French knot more, size-wise, by wrapping once, twice, thrice, or more around the needle. I’ve never tried multiple wraps with colonial knot…perhaps I should try it. French Knots are the bomb. They are so fast and easy to do – love them. Then I discovered colonial knots and loved them too – what to do – a triangle as it were. Have dedicated each style of knot to their own purposes – French knots seem to blend better with one another – so I use them for filling and bunching – Colonials seem to stand alone and have a more finished look so use them for scattering and solitary dots. But they are still both my favorites – what is a girl to do? Love Your Wonderful Site – So much to love in this world! ITA with you on this – they’re interchangeable. I think both the knots look good. I guess I would usethe one depending on the thread used. Good question! I prefer colonial knots and while practice makes perfect, I have difficulty in executing them so….I seem to gravitate to the good ol’ french knots instead. Colonial knots seem to “stand up” more(maybe because the colonials stood up to the British?) and tend to look like a flower to me. French knots (at least my knots) more often than (k)not are a bit floppy, like a wilted flower drooping off to one side or the other. Any suggestions for correcting this? Fantastique tour de main, ou d’aiguille!! merci!! I love Colonial knots, I find them much easier to do. Once I got in the habit of doing them, I find they pull out less and I can work them faster than French knots. I really couldn’t tell which of your examples were French knots and which were colonial knots. Maybe it’s the way I do the knots that I find that colonial knots stand up more and are more spherical in shape. My French knots look more like a doughnut with a flat center. I find that proper tension is more important with French knots. Wrap too loose and it looks sloppy. Wrap too tight and the knot is too tiny. Colonial knots semm much more forgiving and they all turn out looking alike. I do like the look of a well executed French knot and try usually do them when called for. French knots…when I make them at least…end up with a more pronouced “divet” in the center than colonial knots. I agree that colonial knots end up a little larger. I have to try on purpose to make a colonial knot…you know, I have to think about it. A french knot comes natural to me so I always make them. Something that small is a dot any way you make it, I say. I thought the same as Heather as to which one was the Colonial! I am going to guess that the top knot is a Chinese Knot or a Forbidden Knot? I think the same as Palma, when I need a bigger, bolder knot, I use a Colonial instead of a French Knot! Thank you for your wonderful blog which I read every day! I have used them both successfully. I feel very strongly that the colonial knot makes a bigger bump. For that reason, I tend to make colonial knots more often. However, if I want a more delicate knot, I will use a French knot. Are the bottom two colonial? I make both but I somehow like the little centre “hole” formed in the colonial knot. Please tell!!! Have just read your reply to one of your readers Mary: I guessed wrong:( So now – I like both! Still wondering aboout the top one…. I’d have to say I like the look of the French Knot over the Colonial Knot> I think the French is prettier knot! The French Knot is in the lower left hand corner, I think! Love this article! I adore french knots and I am always working to perfect them! Thanks, Mary! First let me say how much I’m learning from your site – thanks for all the effort you put into it! I’ve never done a colonial know (I’m about to watch that video), but my guess is that the knot in the lower right of the triangle is the French know. Am I right, or will we never know the answer? I prefer the colonial knot. I can do a French knot, but they are not consistent. If I need to do a row of knots, they will be colonial knots. In a row of 10 colonial knots, 8 of them will be identical and the other 2 close enough that you’d have to look closely to see the difference. If I did a row of 10 French knots, there would be 2 alike, another 3 about the same size, and the rest would be obviously different from several feet away. I’ve generally noticed a slight difference in size. The Colonial knot is a tad larger. I find it much more uniform in construction than French knots, too. It’s my knot of choice. Thank you! I have been struggling with teaching people the french knot. I never thought of using the colonial knot instead. Makes so much sense. 2″ x 3″ rug. Seems incredible to me, that there could possibly be that many knots! 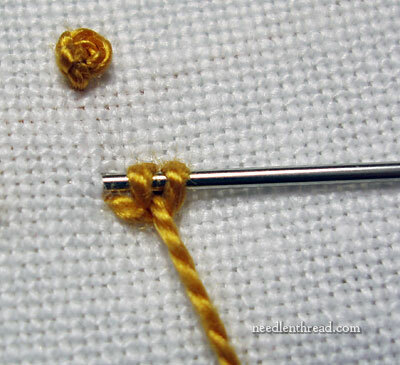 I have used both knots but as I am more familiar with the French knot that is what I use. However, if I am doing candlewicking then use Colonial Knot. be seen above straight candlewicking thread. I haven’t worked on much candlewicking so I would be interested to hear what Candlewickers say. I do both, just to keep my skill up in both, but my go-to knot is the colonial. I find it is easier for my students to learn and master quickly. Mary, Needle ‘n Tread and all the exchange of information in the comments is a wealth of knowledge. So much to learn! Like Eunice Hayes (comment #12) I find the little well in the centre of a colonial knot useful. When I make the eyes on stumpwork faces I first make the iris. I use a slightly thicker needle, coloured thread and work my colonial knot without pulling the working thread too tight. That leaves a dent in the knot, and in this dent I make a smaller black colonial knot for the pupil. Finally a tiny straight stitch in white slightly off centre to add a bit of ‘glint’ in the eye. For years I could not get the hang of french knots; I thought that the thread had to go down the same hole it had come up and that somehow the knot would stay there magically. And of course it didn’t. One day the penny just dropped and suddenly my french knots were perfect. Colonial knots are still difficult – I can make them, but find the figure 8 winding doesn’t come easily, while french knots are much quicker. Also you can vary the size of the knots by changing the thickness of your thread – if you want tiny knots use perle 12, and if you want large fat knots try perle 3. Oops, sorry, forgot the vital question. Mary, there seems to be a school of thought that says a french knot should never have more than 2 wraps and that to increase the size of the knot you use a thicker thread (as I said before). What do you think of this? Personally I use 3 or even 4 wraps at times to get what I want. Hi Mary like so many others I have mastered the french knot and not the colonial knot. So much in fact that I create Dollhouse sized rugs completely done in French knots. Using one strand of floss and one wrap for a fine knot on muslin to keep things nice and small and thin. This way generally takes at least 1500 french knots to fill a one inch square space. I love french knots…Lol. I am guessing that the knot at the top is the colonial knot. I prefer the colonial knot because it is easier for me to make and it “stays together” in a neater fashion all the time. French knots seem to be able to come unwound, or look unwound often. I had never heard of colonial knots until today, I’ve always used French knots and struggled with them. I am making a crochet hedgehog and the pattern suggests colonial knots for eyes. I found your excellent video and I love them!! Quite often when doing French knots they disappear into the crochet work and are inconsistent when I have done embroidery on fabric but colonials are much better. Thank you very much. I CANNOT master the French knot!! I have been embroidering/cross stitching/tapestrying for most of my almost 62 years!! I think when my eyes see “french knot” my brain says “can’t speak that language!! I always opt for beads wherever possible or get someone else to do the knot for me!! I am now going to attempt the colonial knot instead!! I use whichever feel will do best for what I’m sewing. I think the colonial knot stands a shade prouder and can be better in heavier threads – but sometimes I change my mind! I love your tutorials – you have really mastered the video! What is the name of a pattern of French knots? Como iniciante tive dificuldade em aprender o nó que parece simples pois via das 2 formas. Obrigada, seu site é muito esclarecedor, mesmo para quem está começando. I prefer the colonial knot. For me it seems to never come undone as sometimes french knots do and I feel it’s a neater knot. I kinda think french knots are easier to execute and learn, but harder to master; and colonial knots harder to execute/learn but easier to master. Colonial knots are my choice. My experience is that French knots are easier to make but can unravel over time. Colonial knots are a little harder to make, but they remain stable over time. Those of you that use the Colonial Knot I am curious to know whether it might be a little sturdier? Since it goes over the stitch beside it, it makes me feel like it may not fail when tugged on. Comments? I find that my heavy weight silk thread likes to lift up and uncoil in the french knot (it may be my technique), and the colonial knot holds nicely. Your video tutorial makes it so easy! To me, the colonial knot seems a little more stable, although for very fine work I prefer the French knot. When an article that I’m making will be used frequently I would use a colonial knot. I find the colonial knot to be a lot more stable. The french knots tend to move around or fall apart a little when I make them, but colonial knots seem to stay put. It took me a little while to learn the colonial knot but now I prefer it. Colonial knot is sturdier. Esp useful on embroidered clothing. If you brush across a french knot it can easily come undone Not so the colonial! A quilter with 70 years experience (!) shared the colonial knot with me. One difference between colonial knot and French knot is colonial knot appears to be flat whereas French knot appears to be raised. I felt that is the only difference between them other than the working method.